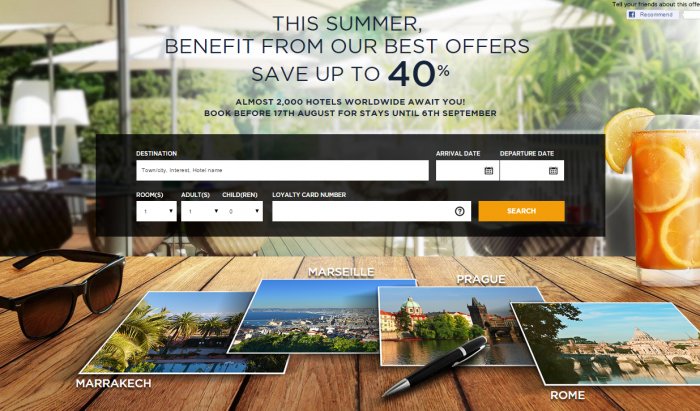 Le Club Accorhotels has also launched up to 40% off Summer Sale for stays until September 6, 2015, that are booked by August 17. The discounts are brand dependent and not all hotels (2,000 do) participate. Most of these rates are prepaid, non-refundable and noncancelable. You can access this sale here. Just an offer to keep in mind if you are planning to stay at Accor hotels this summer. Just remember that these rates are inflexible in cancellation terms and prepaid. Book your 3 or 4-night stay & save 25%. Book for 5, 6 or 7-night & save 30%. In addition, enjoy a champagne cocktail aperitif with snack at the hotel bar plus late check-out until 3pm. Offer available from 18th May 2015 to 28th August 2015 and for stays from 1st June 2015 to 31st August 2015. Full amount of stay is payable in advance by credit card at the time of booking. Offer includes room, one champagne cocktail aperitif with snack at the hotel bar for one or two persons, late check-out until 3pm. The 25% discount is based on the “Best Flexible Rate” (at the time of booking). This offer cannot be combined with any ongoing offers, promotions or discounts. In the event of early departure, no refund will be given. The aperitif is served once per stay in the bar. Two complimentary breakfasts from Pullman and up to 15% off your stay. To power-up body and mind after a restful night’s sleep. Because a hearty breakfast is the best way to start a new day. Start the day with a smile at MGallery Collection hotels! This offer includes your room, buffet breakfast in the hotel restaurant, and a 2pm late checkout. Offer available from 29 th June 2015 to 31st August 2015 and for stays from 04th July 2015 to 06th September 2015. The amount due is not refundable even if the booking is cancelled or modified. This offer includes your room, buffet breakfast in the hotel restaurant, and a 2pm late checkout. Full amount of stay is payable in advance by credit card at the time of booking. Indulge in the perfect getaway… Enjoy up to 40% off your stay, with free breakfast included. It’s a lot better at Novotel! Full amount of stay is payable in advance by credit card at the time of booking. Full deposit is not refundable even if the booking is cancelled or modified. Offer is valid in participating hotels for stays from 3 July to 6 September 2015 and subject to availability. For hotels located in the United Kingdom, the offer is valid for stays from 17 July to 6 September 2015 and subject to availability. Treat yourself a sweet escape and enjoy up to 40% off your stay with breakfast included. “Offer is valid in participating hotels for stays from 3 July to 6 September 2015 and subject to availability. The “Unforgettable Nights” offer is valid for stays between 10 July 2015 and 06 September 2015 inclusive, with some exceptions (1). The offer is valid in participating ibis, ibis Styles and ibis budget hotels in Europe, Africa and India. « The Unforgettable Nights » offer is the price including tax displayed at the time of booking and is valid for one room (limited to the maximum number of persons authorized per room). For ibis Styles hotels, the price includes an unlimited buffet breakfast and unlimited WIFI. The reservation must be made in advance on the internet, via call centers or directly with the hotel. The offer is subject to availability and limited to the number of available rooms for this offer on the date of the stay in the hotel selected by the guest. This offer can be used several times during its period of validity. It cannot be used in conjunction with other current promotions or offers. “The Unforgettable Nights” offer has to be entirely prepaid. The amount due is not refundable even if the booking is cancelled or modified. Discounted breakfast is only available while booked at the same time as the room. No discounted breakfast will be proposed after the confirmation of the booking. Discounted breakfast bookable exclusively on ibis.com, accorhotels.com, call centers and direct hotel and available in a selection of hotels. Offer subject to conditions and availability. Offer is valid for booking from 3 June 2015 to 29 August 2015 at participating ibis, ibis Styles and ibis budget hotels in France, for stays between 3 July 2015 and 30 August 2015. The guest accepts prepayment of the full price of the stay at time of booking. This sum is not refundable in the event of cancellation or modification to the booking dates.Offer subject to conditions and availability. The guest accepts prepayment of the full price of the stay at time of booking. This sum is not refundable in the event of cancellation or modification to the booking dates. Rate subject to availability of the rooms allocated for this offer at the guest’s chosen hotel on the date of stay. Available at participating hotels. Prices from EUR 24 per room per night (excluding breakfast). Offer valid for all reservations made between 16 February and 30 August2015 for stays between 19 June and 30 August 2015 in participating hotelF1 hotels. See list of participating hotels. Reservations must be made in advance, exclusively via www.hotelf1.com, www.accorhotels.com or via the hotelF1 mobile site or app. Offer is available up to the day before the guest’s chosen arrival date, subject to availability of the rooms allocated for this offer at the guest’s chosen hotel. When the reservation is made, the total amount for the stay will be debited from your card as prepayment. Offer may not be modified, cancelled or refunded. Offer cannot be used in conjunction with any other current promotions and/or benefits. Next articleThai Airways Soon Banned From Flying To The US?